If efficient light modulation at the window is desired, vertical blinds are the right choice when planning your project. Depending on the position of the sun, the operation of the hanging, which consists of individual slats, permits an optimum regulation of light and view. 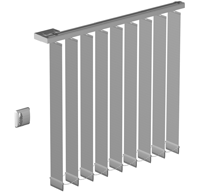 Thanks to Perlex or other functional coatings on the rear side of the slats, incident rays of light can be effectively reflected and thus offer outstanding privacy and glare protection in the modern world of communication and work and in particular at PC workstations. For sophisticated architecture, large window areas, doors, transom windows, many special shapes and as room partitions, they are the ideal solution when it comes to effective, purpose-orientated and aesthetic shading. In addition, accents, contrasts or colour graduations can be skilfully conceived with the individual slats – to suit the respective style of the room. 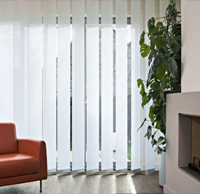 vertical blinds adjust the lighting conditions in the finest graduations depending on the desired depth of effect and are particularly flexible in use. Over 400 unis, decors and material structures, in four different transparency stages, function-orientated fabrics including Trevira CS, Perlex or aluminium rear-side coating, glass fibre, flame-resistance, suitability for PC workstations, dimout function, antibacterial equipment, suitability for wet rooms, noise protection function, Öko Tex Standard 100.